Here in this blog I will share two scenarios when this happening and basic troubleshooting steps when facing this issue. SQL Server Reporting service version does not meet AX requirement. Exception occurred during report definition processing. There is no one shoot solution for this, but general troubleshooting steps could help to identify the cause, here is a demo for one of my scenario. AOS is using meta data service to provide the interface to resolve label, which is hosted on WCF service. Ideally we will trace to verify if the label resolve step is happening or not. This will create a messages.svclog file under C:\logs. You may put it to somewhere else. We need to merge this xml content to Ax32Serv.exe.config and restart AOS to apply the change. Invalid enum value ‘GMTMINUS0300SANTIAGO’ cannot be deserialized into type ‘Microsoft.Dynamics.AX.Framework.Services.Metadata.Enums.TimeZone’. Ensure that the necessary enum values are present and are marked with EnumMemberAttribute attribute if the type has DataContractAttribute attribute. That this exception interrupted the report processing. 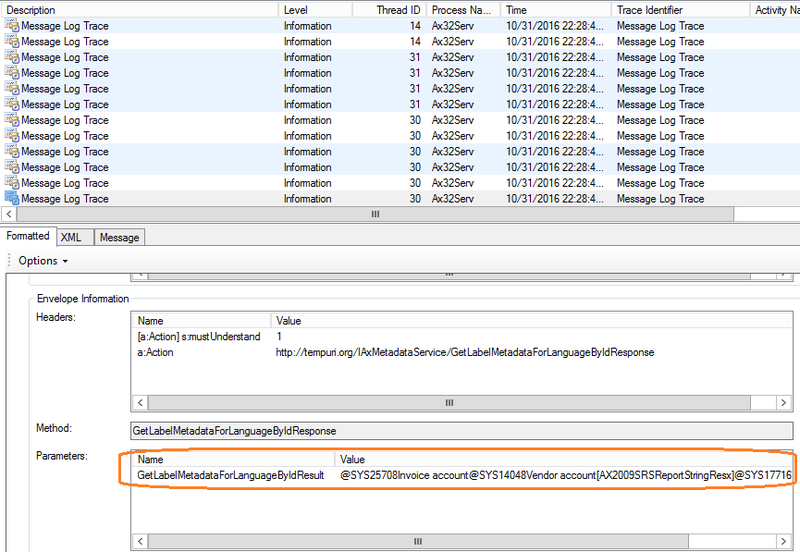 Check the ax extension version against the reporting service, the extension dll was RTM version. Which is introducing current issue. Upgrade the AX report extension on reporting service machine to resolve this issue.